PLEASE NOTE THAT TICKETS ARE SELLING EXTREMELY FAST FOR THIS EVENT - BUY NOW SO YOU DO NOT MISS OUT!! See you & your friends there! Be sure to "Like" & "Share" above to help spread the word!! Ticket includes admission into the Louisville Taco Festival on Saturday 6/08 and your first drink FREE. THIS PRICE IS LIMITED TO 500 TICKETS ONLY! 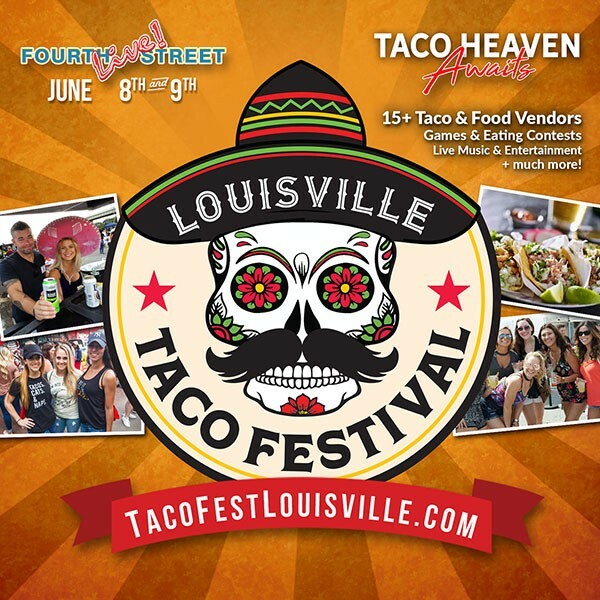 This ticket includes admission into the Louisville Taco Festival on SATURDAY 06/08, 5 taco vouchers, your first drink FREE and a commemorative gift bag with a bottle of hot sauce and giveaways. THIS PRICE IS LIMITED TO 500 TICKETS ONLY! VIP ticket includes 120 mins early entry admission (12PM) into the Louisville Taco Festival on SATURDAY 06/08, 2 Hour All Exclusive VIP Bar (12PM - 2PM featuring beer, call drinks, soda), a commemorative gift bag with a bottle of hot sauce and giveaways, private VIP area with private bathrooms & bar. Beverage Vouchers exclude shots and the Tequila Sampling Expo. Only 100 tickets are available at this discount price! Ticket includes admission into the Louisville Taco Festival on SUNDAY 4/15 and your first drink FREE. THIS PRICE IS LIMITED TO 500 TICKETS ONLY! This ticket includes admission into the Louisville Taco Festival on SUNDAY 06/09, 5 taco vouchers, your first drink FREE and a commemorative gift bag with a bottle of hot sauce and giveaways. THIS PRICE IS LIMITED TO 500 TICKETS ONLY! VIP ticket includes 120 mins early entry admission (12PM) into the Louisville Taco Festival on SUNDAY 06/09, 2 Hour All Exclusive VIP Bar (12PM - 2PM featuring beer, call drinks, soda), a commemorative gift bag with a bottle of hot sauce and giveaways, private VIP area with private bathrooms & bar. Only 100 tickets are available at this discount price! - Acccess to every Restaurant & Bar at 4th Street Live! - Live Authentic & Modern Entertainment & much more! At the event, you'll find 15 of the area's best restaurants & food purveyors dishing out a variety of $3 tacos (sold separately). There will be bars and beverage stations serving margaritas, tequila flights, ice cold beer, water, soda & more. All items will work on a voucher system - there will be various voucher stations throughout the festival & all vouchers will be used as cash. Additional vendors will be on hand to sell other food (cotton candy, cakes, desserts etc) as well. Multiple ATMs will be on site & strongly encourage cash sales at voucher stations.